Snapjaws are rare, invulnerable piranha enemies similar to Lockjaws. They only appear in Donkey Kong Country 2: Diddy's Kong Quest. They are succeeded by Nibblas in Donkey Kong Country 3. A Snapjaw swims below Diddy and Dixie. A Snapjaw is the main enemy of Slime Climb and Clapper's Cavern. It follows the Kongs while swimming along the water surface. If Diddy and Dixie fall into the water, the Snapjaw bites them. Snapjaws cannot be defeated, including from Invincibility Barrels. When Diddy and Dixie are temporarily invincible and swim into the Snapjaw, numerous small, orange sparks appear around the Snapjaw (for effect) as it continues chasing them. The Kongs' only option is to avoid the Snapjaw. If the Kongs are idle on land, the Snapjaw swims directly below them back and forth. In Slime Climb, Diddy and Dixie have to climb up a rapidly sinking ship while the Snapjaw swims after them. In Clapper's Cavern, another Snapjaw follows the Kongs throughout the entire level. In most parts of the stage, the Kongs cannot swim across because of the Snapjaw. Rather, Diddy and Dixie must jump onto Clapper the Seals, which appear throughout the level, to temporarily freeze the water into ice so they can get across safely. While they cannot be defeated normally, Snapjaws can be defeated from a glitch in Slime Climb. 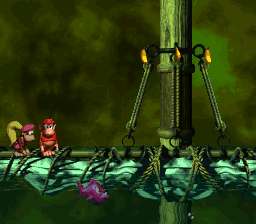 First, Diddy and Dixie must jump into the water at the beginning, then swim to the bottom as quickly as possible, but not too low, otherwise the Kongs lose a life. The Snapjaw must then bite either of the Kongs, which causes it to be stuck. The surviving Kong can then safely continue without the Snapjaw. Snapjaws do not appear in Donkey Kong Land 2. Instead, the game's level equivalents, Slime Climb and Clapper's Cavern, has harmful water in place of the Snapjaws. The Kongs must avoid touching the water.